John Maynard Keynes (1883-1946) was a British economist most famous for a set of ideas regarding macroeconomics that would eventually coalesce into the Keynesian economics school of economic thought and theory. 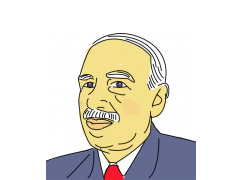 Renowned for leading a revolution in economic thought, Keynes has been featured in many publications as one of the most influential figures of the 20th century with his theories and ideas shaping the discourse surrounding modern economics to this very day. Keynes was born in 1883 as part of an upper-middle class family. His father, John Neville Keynes had switched between mathematics and moral sciences while studying at Cambridge, paving the way for a moralistic but economic-minded background that accompanied Keynes throughout the rest of his life. In 1897 on the strength of his precocious mathematical knowledge, Keynes was awarded a scholarship to attend Eton college where he obtained a superb academic record and developed writing skills that would soon be put to paper. He received yet another scholarship for the study of mathematics for King’s College in Cambridge. During this time in his life Keynes was torn between studying economics (with economists like Alfred Marshall attempting to persuade him to do so) and his love of philosophy and ethical systems. He would eventually graduate with a BA in Mathematics, but not before joining the Cambridge Apostles club of debating and losing his faith in G.E. Moore’s ethical system. On finishing his course at Cambridge in 1906 he quickly found placement within the India Office as a junior clerk for the military department. Job dissatisfaction eventually led him back to Cambridge where he earned a fellowship at King’s thanks to his work on Probability. In 1913 he finally published his first book, Indian Currency and Finance and was subsequently appointed to the Royal Commission on the subject. With the advent of World War I he was called to London where in 1915 he would eventually take an official position within the Treasury. His success and efficiency in his position eventually lead to his selection as the Treasury’s official representative to the Versailles Peace Conference in 1919. While the conference did much to shape Keyne’s ideas about macroeconomics, he was unfortunately unsuccessful in convincing the victorious powers to apply his ideas to Germany’s surrender conditions. These were eventually laid out in detail in one of his more famous works, 1919’s The Economic Consequences of the Peace. The 20s and 30s saw Keynes publish a series of works on the post-war Economy as well as the Great Depression, including perhaps his most famous work, The General Theory of Employment, Interest and Money. During the Second World War Keynes would eventually become heavily involved as the head of Britain’s delegation to the Bretton Woods negotiations. His suggestions and ideas would heavily influence the creation of international economic institutions. Despite deteriorating health and a series of heart attacks he continued working to institute his idea of an international monetary structure, dying shortly after returning from the United States in 1946 at the age of 62. Keynes’ body of work is considerable, although perhaps the most significant of his assertions was that economic output is very much influenced by aggregate demand. Keynesian economics were effectively the first major revolution within liberal economics, displacing classical liberal economics that had been largely built on Adam Smith ideas. Keynesian economics is also contingent on the notion that private entities will not always pursue decisions that are productive to the macroeconomic environment. Their failure to do so must be rectified through government action and public policy, with Keynes usually advocating bothfiscal and monetary policies to stabilize the business cycles and rectify recessions. Despite several agreements with monetarist economists over the consequences of unaddressed business cycles, the extent to which such failures must be corrected by public actors has been a source of contention. While Keynesians highlight the need for interventionist fiscal policy alongside monetary policy, Monetarists argue that the economy is more prone to equilibrium than Keynes suggests, and monetary policy through central banks is usually enough to correct deviations. Keynes was also adamant in concluding that full employment is by no means an automatic end point, unlike many economic approaches that suggest different levels of momentum towards a state of equilibrium with the end goal of full employment. His support of international institutions, vital to the development of both the World Bank and the IMF, is also a good example of his global outlook towards macroeconomics. This was especially true in a post-war world where good finances might be the difference between war and peace. Even during his lifetime much work had already been put forward that built on Keynesian economics to develop new theories and models. The advent of Neo-Keynesianism is perhaps the most important of the new schools of thought that emerged from this revolution in liberal economics. John Hicks, Franco Modigliani and Paul Samuelson had a central role in the development of neo-Keynesianism through their attempt to align it with more microeconomic oriented neo-classical economics. Their neo-classical synthesis would go on to become the core of the neo-Keynesian school of economics, effectively dictating the rules of macroeconomics at a global level well into the 1970s. With economic slowdown, problematic stagflation and renewed attacks by the Chicago School of Economics, Hayek’s Austrian School and Milton Friedman’s successful prediction of stagflation in monetarist economics, neo-Keynesianism went into decline. The new hegemony of monetarist policies however was eventually faced with its own crisis that led to the recent resurgence in neo-Keynesian economics. The scale of the 2008 global financial crisis soon led to calls for government intervention and stimulus to prevent a 1930’s style depression. This has led to the current economic climate of neo-Keynesian thought struggling to prevent a slide back into laissez-faire policies. The next few decades should be interesting to any observer who is aware of Keynesianism’s rise and fall as well as its continuing battle with monetarism, or as Keynes would put it: “The difficulty lies not so much in developing new ideas as escaping from old ones”.